Alan Alda is known to many people as the actor in the US television series M.A.S.H and later in The West Wing. But he’s also passionate about science and is the visiting professor at the Alan Alda Center for Communicating Science, at Stony Brook University in New York. Alan is in Australia this month to help spread his message about the importance of communicating science and he spoke with Will Grant and Rod Lamberts from the Australian National Centre for the Public Awareness of Science at the ANU. Will: Why are you keen to get into the world of science and science communication? Alan: I think I’ve been interested in science, like all humans I think, since I was a little boy. I think we all start out as little scientists trying to figure out how things work and how we fit in and what we can do with the things around us. When I was a kid, I used to spend a lot of time doing what I thought were experiments. I would mix things I found around the house to see if I could get something to blow up. Rod: Did you study much science? Alan: No, I didn’t. My father wanted me to be a doctor because he had always wanted to be a doctor but then went into show business at an early age because of the Depression. Oddly enough, he could make a living as an entertainer rather than as something more stable. Nowadays, it’s the other way round. You have to be a waiter so you can afford to be an actor. He went into show business and didn’t become a doctor, as he had always wanted, so he wanted me to be a doctor. And when I was in college he pled with me to take a pre-med course in chemistry to see if I would be interested in following through and becoming a doctor, and I really didn’t want to do well in the course. Alan: I was afraid it would lead to a life of blood-spattered clothes, talking to sick people. This scared me and I didn’t want to do it. I partly purposely did poorly in the course, and partly it was my own natural incompetence that allowed me to get a final grade of, on the final exam, I got a score of ten out of a hundred. I had a very shaky start with science education. It wasn’t until after college that my curiosity kicked back in again. Since then, most of the things I read have to do with science because I find it so fascinating. Will: You’re meant to inspire people to want to become a scientist or move into this career but you’re saying it’s only after college that you developed that interest, that’s a failing from our profession really. Alan: One of the things that I’m lucky that I have is curiosity plus a healthy dose of ignorance. Rod: You can’t underestimate the power of ignorance. Alan: It’s really wonderful if it’s combined with curiosity it’s perfect because then you have this empty hole to fill and your curiosity keeps urging you to pile it in. I just love to find out what new things scientists are discovering and, when I find out, I love to tell my friends what I just found out: “Can you believe this microbe they’ve found?” But I’m so enthused about it, their eyes don’t glaze over so I’m happy about that. Do you know about that microbe? They’ve got a bunch of microbes that expand or contract, depending on whether or not they’re wet. And if you have a couple of pounds of them, they’re so strong when you wet them they’d lift the back end of a car. So these microbes could change your tyre for you. I think that’s just wonderful. Rod: When did you make the transition to say “I’m involved in science communication” rather than just science in general? Alan: That grew out of the television show I did on public television in the United States for 11 years, a show called Scientific American Frontiers. I don’t know if it was shown in Australia or not. Will: I think there were individual episodes that came up and were cut into other shows. Alan: It was wonderful. I counted once, I think, I interviewed about 700 scientists. And I realised that what we were doing was a different way of interviewing about science. It was just a pure conversation like the conversation we’re having now. It was freewheeling, I didn’t have a list of questions. I just wanted to understand them and there was something about that that was so personal, that it brought out the personality of the scientists and they were real people, they weren’t lecturing. When the show was over, I thought, wouldn’t it be wonderful if scientists could do that naturally without somebody next to them like me, drawing it out of them? How could we get them into that conversational tone? Whenever I would be at a university where they taught science, I would try to talk the president of the university into the idea of teaching communication while they taught science, because if you can graduate experienced scientists, capable scientists who are also capable communicators, then the public has a chance to learn something from them. Will: Do you think you can go too far, where the scientist gets so enthusiastic that people start to run away or turn away or indeed trivialise the communication enterprise? Alan: What we try to teach is, first of all, not dumbing down the science. Science is exciting and it doesn’t need to be dumbed down, I’m sure you agree with that. Alan: What we really look for is clarity and vividness. Will: Vividness, it’s a great term. I mean clarity comes up a lot in these circles but vivid! Alan: And to be vivid, to me, is to show us how it affects our daily lives, what the stories are that led to these discoveries. There’s a very interesting example of that. There’s a scientist in the States who discovered the world’s thinnest glass. It was only one atom thick and it was referred to as two-dimensional glass because the top layer of it is the same atom as the bottom layer of it, so it’s, in a way, two dimensional. It had never been seen before. So he wrote about it, he and his graduate student who discovered it together, wrote about it in a science journal and it got a little attention. The story is the important thing. We need to hear stories. He then started, when he talked about it to the press, he led with that story and it turns out news of his work started to spread in newspapers and blog posts all across the United States and the United Kingdom. And it was because he used a story. Rod: I think that it’s kind of frightening, the idea that they have to somehow be able to tell a story. And coming from someone with your background that can be quite confronting I imagine? Alan: One of the things that I try to do is, try to spread the idea of what a story is. If you’re not accustomed to telling stories, sometimes you can reduce everything to the final, the bottom line thing, there’s not much of a story in that. Will: I’ve always thought, everyone is used to stories in the sense that everyone hears stories all the time. We watch TV, we read books, those kinds of things, so we’ve got an implicit understanding of it but it’s a very different to tell the story. Alan: Yes. An example is what we’re doing at the World Science Festival in Brisbane. We combine art and science as much as we can, including story telling. Brian Greene, the physicist, is doing a show that tells stories of Einstein and I’ve written a theatre piece that covers Einstein’s letters to his two wives. It shows him as a human. 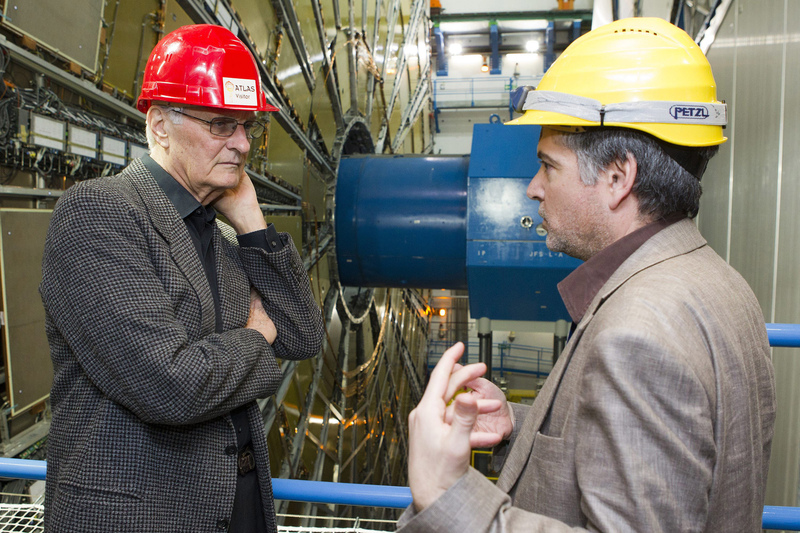 I think when we see scientists as human beings, the door is open for us a little bit, we can go into their lives. They’re not the white-coated gurus on the mountaintop. Will: In terms of your Center for Communicating Science at Stony Brook, what’s your dream scenario in five years or ten years' time? Where do you want science and the world to be? Alan: What I hope is that we have inspired every university in the world that teaches science to also teach the communication of science. In my opinion, communication is not something you add onto science like icing on a cake. It’s the cake itself, it’s of the essence of science. You can’t do science without talking about it to other scientists and if you want funding you’ve got to talk about it to the public, and to the policy makers. Nobody is going to give you money if they don’t understand what you’re doing. So I’d like to see it spread all over the world. Will: It’s a practical vision as well. Embedding communication in the teaching program for science students. This is a thing that’s integral to what they are doing, it’s the cake, as you say. This isn’t some airy vision of “okay, I just want things to be better”. This is a practical step that universities around the world can really get involved in. Alan: I see that too. Now, rather than people needing to be sold on the idea that communication is important in science, now they’re knocking on our door. We have more requests to affiliate with us than we can handle at the moment, we’ll have to reorganise in the next couple of months. Will: What kind of questions do you wish people would ask you more? Alan: I think everybody asks good questions. Something that they probably don’t think to ask is why it seems to be good for the public to hear about science through good communication. And it seems to be helpful that good communication helps the funding of science. But what does it do for the scientists? That wouldn’t have occurred to anybody, it certainly wouldn’t have occurred to me, until scientists who took our training started to tell us that they actually were doing better science. They were thinking about their science better the more they learned to focus their description of their work. Because once they’d got used to distilling the message about their work, they looked at their work in a more focused way. And it actually helped them think more clearly about the things that they were doing in the lab. I never expected that to happen and I think it surprises them too. Will: That’s a real contribution to the world of science, to have people doing science better. That’s a really important thing. Alan: And the other way they do it better, of course, is that if two scientists meet to collaborate but don’t speak the same language, it’s only if they are good at communicating that they can actually collaborate in the same language. 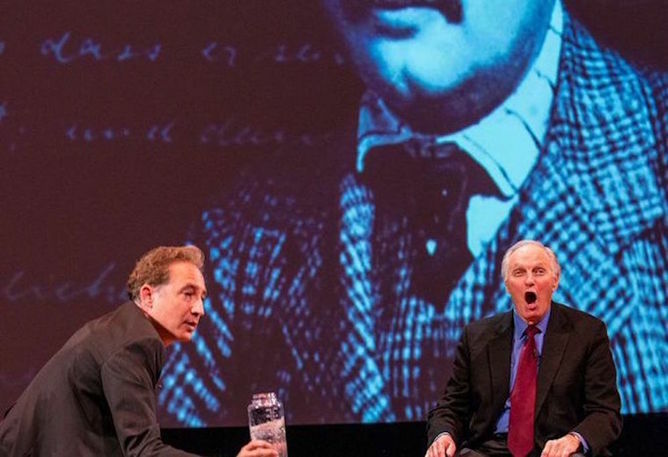 The full conversation between Alan Alda, Will Grant and Rod Lamberts is available here, including more on science communication, and his thoughts as a actor on the difference between playing the good guy or the bad guy in any drama. 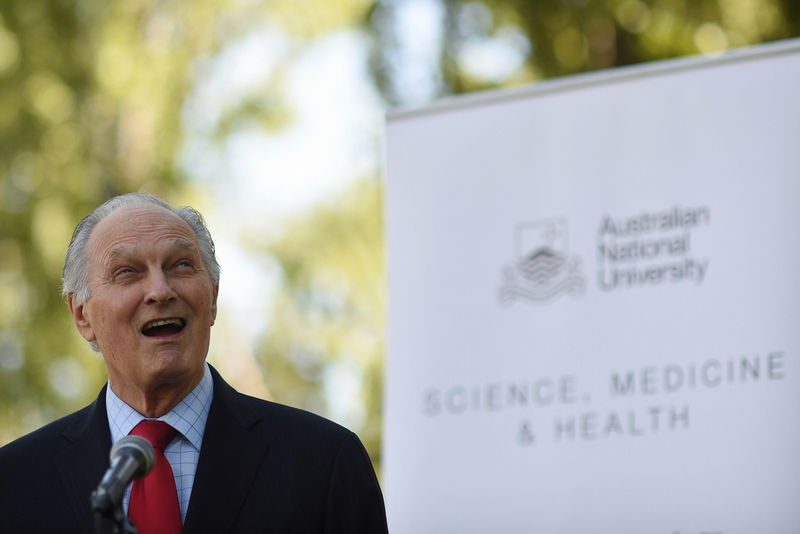 Alan Alda will be speaking at the National Press Club on Thursday, March 10, 2016, and then heading to the World Science Festival in Brisbane (March 9 to 13, 2016).